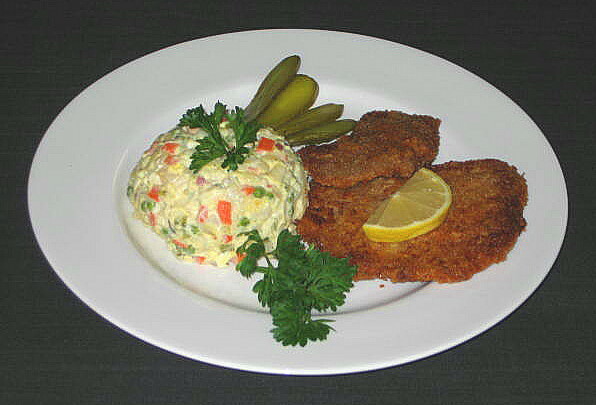 Butterflied pork tenderloin cutlet with potato salad, lemon and pickle. Tonight, I took a test run for North Bohemian traditional Christmas lunch: Schnitzel, potato salad and pickle accompanied by a beer or two. Tonight’s version didn’t include traditional veal cutlet but the substitute under blind taste test would be indistinguishable. I used butterflied and pounded pork tenderloin slices seasoned with fine sea salt, ground pepper and hot Hungarian paprika. Since I used only half of a small pork tenderloin all I got was two butterflied cutlets and two smaller pieces but it was more then enough for two of us. 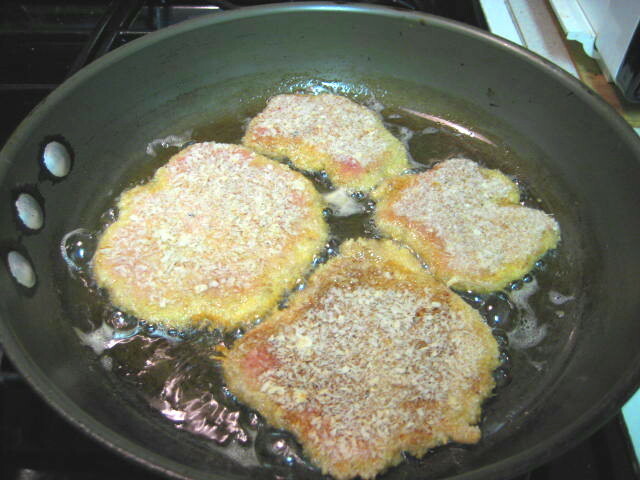 To add more substance to the meat I breaded the cutlets in egg wash and Panko bread crumbs and they came out absolutely perfect. Nice and crunchy on outside and, since the Panko coating provided virtual shell, the pork inside was steamed to tender perfection. There really isn’t much of a recipe, it is that simple, just a process. ﻿Cut the tenderloin about 1/2” thick almost through and then another 1/2” all the way. Repeat. Spread flat, put in plastic bag and pound till about 3/16” thick. I prefer see through bag rather then traditional aluminum foil because I can see what I’m doing. 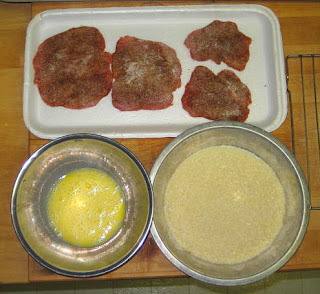 On one side sprinkle with salt, pepper and paprika and roll both sides of cutlet in flour. Dip in egg wash and then drench in Panko. The pan and oil is right temperature. 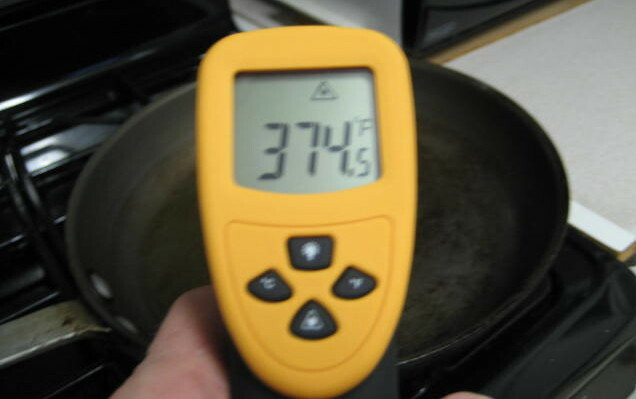 Preheat large frying pan, pour in oil about 1/4” deep, let it get hot and drop as many pieces as will fit without crowding the pan. After 3 minutes start checking for color. When light gold, turn over and shallow fry till other side is done. Meanwhile, serve room temperature potato salad on preheated plate, cut slice of lemon and slice pickle into 3 slices and reserve. 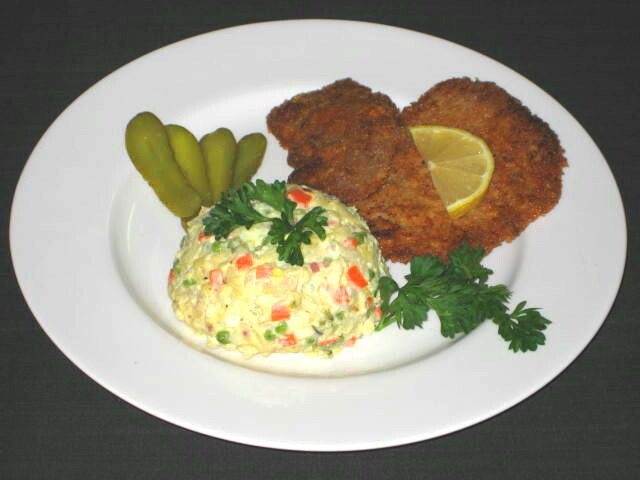 Plate cutlet next to salad, top with lemon and pickle and serve.